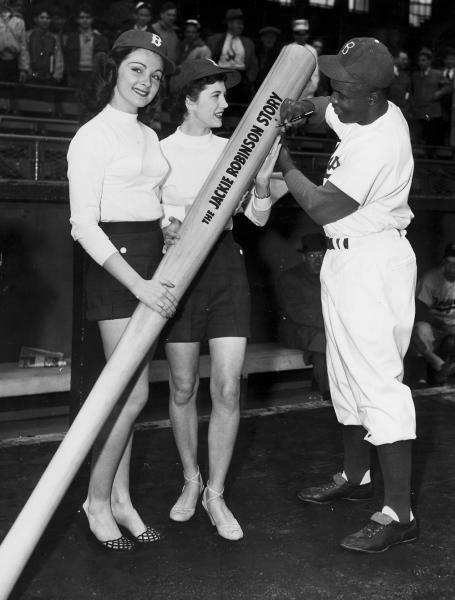 That’s Jackie Robinson promoting the 1950 biographical film “The Jackie Robinson Story.” Robinson played himself in the movie. Yes, Jackie Robinson made a movie three years into his big league career and he played himself. I had no clue until this week. It’s about 1 hour and 12 minutes long and I watched the entire movie. As a movie, it’s awful. As a biopic and an insight into Jackie the person, it’s wonderful. So, if you can look past the terrible production value and acting… it’s a must-watch. Oh, you can watch the entire movie on YouTube. I love you, internet. This entry was posted in Baseball, MLB, Movies and tagged Dodgers, jackie robinson, jackie robinson day, jackie robinson infographic, The Jackie Robinson movie, The Jackie Robinson Story, The Jackie Robinson Story movie. Bookmark the permalink.